2-522-1 Noshio, Kiyose, Tokyo 204-8588,Japan. As L-DOPA replacement is the main treatment for patients with Parkinson’s disease, monitoring of the blood dopamine (DA) concentration is useful for prediction of peripheral adverse events. We studied patients with advanced Parkinson’s disease for whom L-DOPA and an NMDA receptor antagonist, amantadine, had been prescribed since 2006 at Sakura Hospital, Toho University Medical Center. 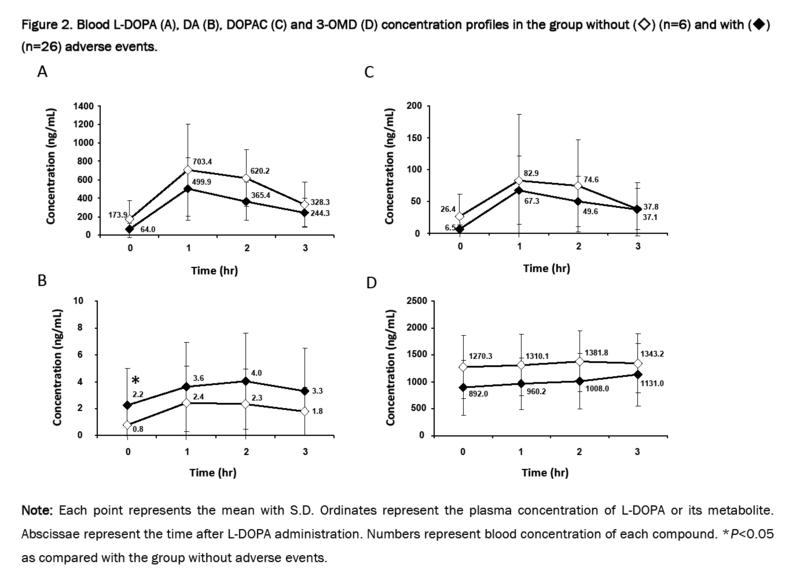 The blood concentrations of L-DOPA, DA, 3,4-dihydroxyphenylacetic acid (DOPAC) and 3-O-methyldopa (3-OMD) before and at 1, 2 and 3 hours after administration of L-DOPA and amantadine were measured using a high-performance liquid chromatography-electrochemical detector (HPLC-ECD) system. We used hospital medical records to establish the age of the patients, and their gender, Unified Parkinson’s Disease Rating Scale (UPDRS) motor scores, L-DOPA dosing regime, use of amantadine in combination with L-DOPA, and adverse events. Parkinson’s disease is a progressive condition in which brain cells degenerate and are lost, resulting in tremor, muscular rigidity, akinesia, and postural reflex as the four major symptoms. The main treatment for Parkinson’s disease is medication with L-DOPA, a dopamine (DA) precursor, which ameliorates the symptoms by increasing the concentration of DA in the corpus striatum. Although L-DOPA is a “silver bullet” for Parkinson’s disease, long-term administration is associated with a decrease in efficacy and symptomatic instability such as the “wearing off” phenomenon and “on-off” phenomenon after 10 years or so. Other adverse events such as involuntary movements, dyskinesia, hallucination or delusions may also occur as the L-DOPA dosage is increased. Treatment guidelines recommend that if the dose of L-DOPA is increased, a DA receptor agonist or an NMDA receptor antagonist, amantadine, should be added for patients with advanced Parkinson’s disease who have developed the dyskinesia . Amantadine was first recognized as an antiviral agent  but soon afterwards was also found to be useful for treatment of Parkinson’s disease . Although the utility of amantadine for treatment of Parkinson’s disease was initially assumed to result from its effects on dopaminergic systems , it was later found to be a NMDA receptor channel blocker . Combination therapy with L-DOPA and amantadine ameliorates the symptoms of Parkinson’s disease, decreases the L-DOPA dosage and diminishes the severity of L-DOPA-induced dyskinesia [6,7]. However, use of amantadine has certain negative aspects such as development of adverse events and uncertainty about the mechanism of its effectiveness for Parkinson’s disease. In addition to the movement disorder, patients with Parkinson’s disease often show non-motor disorders, particularly gut disorder [8,9]. Delayed gastric emptying affects the quality of life of patients, because gastroparesis often causes nausea, vomiting, postprandial abdominal or epigastric pain, or bloating . L-DOPA delays the arrival of gastric contents into the small intestine, thus decreasing the absorption of L-DOPA . Thus, oral administration of L-DOPA to elderly Parkinson’s disease patients leads to a decrease in the maximum concentration of L-DOPA in blood . Individual differences in the absorption of L-DOPA lead to variations in metabolic function and therapeutic effects, and we have reported that monitoring of the blood DA concentration is useful for prediction of peripheral adverse events [13,14]. 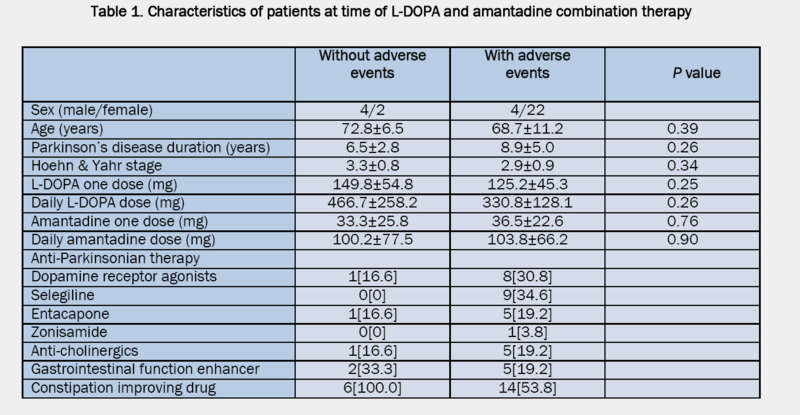 In order to clarify the development of adverse events induced by L-DOPA and amantadine, it is important to know the L-DOPA kinetics of individual patients, as well as considering the effects of amantadine on the action of DA (Figure 1). In the present study, we investigated the efficacy of combination therapy with L-DOPA and amantadine in patients with Parkinson’s disease, and the feasibility of predicting adverse events by monitoring the blood concentrations of L-DOPA and its metabolites. We studied 32 patients with advanced Parkinson’s disease who had been taking 100 - 1,000 mg L-DOPA 3 times per day and who had also been receiving amantadine combination therapy with amantadine hydrochloride (Symmetrel® Tablets 50 mg) from 2006 to 2012 at the Neurology Division, Department of Internal Medicine, Toho University Medical Center Sakura Hospital. All the patients were surveyed after obtaining approval from the hospital institutional review board. We used hospital medical records to establish the age and gender of the patients, their Parkinson’s disease morbidity period, Unified Parkinson’s Disease Rating Scale (UPDRS) motor scores, L-DOPA dosing regime, medicines used in combination with L-DOPA (types and dosing regimen of other anti-Parkinsonian medicines) and adverse events. Part I: Evaluation of mentation, behavior, and mood. Part II: Self-evaluation of activities of daily life (ADLs) including speech, swallowing, handwriting, dressing, hygiene, falls, salivation, turning in bed, walking, cutting food. Part III: Clinician-scored motor evaluation. Part IV: Complications of therapy. IVA: Dyskinesias, IVB: Daily fluctuations (off time), IVC: Other complications (anorexia, nausea, vomiting, insomnia, sleepiness and orthostatic hypotonia). Each subscale has a 0-4 rating, where 0=normal, 1=slight, 2=mild, 3=moderate, and 4=severe. To measure the concentrations of L-DOPA and its metabolites, blood was collected from a peripheral vein 4 times: before, and 1, 2 and 3 h after administration of L-DOPA and amantadine. The collected blood samples were immediately centrifuged at 13,000 rpm at 4 °C for 10 minutes, for separation of the plasma components. The plasma samples were saved at -30 °C for measurement. To adjust the concentration of 3,4-dihydroxybenzylamine (DHBA) (internal standard) to 10 ng/mL, DHBA was added to 200 μL of each plasma sample, and 0.5 mol/mL PCA 200 μL was also added. The sample was centrifuged at 13,000 rpm at 4°C for 15 minutes, and peaks of L-DOPA, L-DOPA metabolites and DHBA were measured by injection of 10 μL of supernatant into a high-performance liquid chromatography - electrochemical detector (HPLC-ECD) system. The amounts of L-DOPA and L-DOPA metabolites (DA, DOPAC and 3-OMD) were measured using an HPLC-ECD system equipped with a DGU-14A degasser, LP-10ADvp pump (Shimazu, Tokyo, JAPAN), and an electrochemical detector ECD-700 (EiCOM Co., Tokyo, JAPAN). Data were recorded using a CHROMATOPAC C-R6A (Shimazu, Tokyo, Japan). Chromatographic separation was performed on an ODS pre-column (EiCOM Co., 5 μm, 3.0x6.0 mm) and a main column (EICOMPAK, SC-5ODS, 3.0x150 mm). The mobile phase was 0.1 M citric acid - acetate buffer (pH 2.6), containing 5 mg/L EDTA·2Na and 30 mM 1-octansulfonic acid sodium salt, and methanol 80/20 (vol/vol). The flow rate was set at 0.5 mL/min. The potential of the glassy carbon electrode was set at 750mV vs. an Ag-AgCl reference electrode. The temperature of the columns and the detector was adjusted to 25°C. The limit of sensitivity for DA was a few pg for the standard. Quantitative analyses of L-DOPA and L-DOPA metabolite concentrations were performed by the internal standard method using DHBA. All data were analyzed using Microsoft Office Excel 2012 (Microsoft, USA). Numerical results are expressed as the means ± S.D., and statistical significance was calculated by Student’s t test. Differences at P<0.05 were considered to be statistically significant. In order to evaluate the relationships between the blood concentration of L-DOPA and its metabolites and the development of adverse events, we divided patients who had and had not suffered adverse events of L-DOPA with amantadine treatment into two groups based on the information in their medical records. Six of the studied patients had not suffered adverse events, and 26 had suffered such events (Table 1). There were no significant inter-group differences in age, disease history, Hoehn & Yahr severity, L-DOPA dosage, or amantadine dosage. The results of UPDRS assessment included in the adverse events were as follows (Table 2). In part I, which included an item for assessment of hallucination, the scores for patients with adverse events tended to be higher than those for patients without adverse events. In part IV, which included an item for assessment of complications, the scores for IVA and C tended to be higher in patients with adverse events than in those without adverse events. There were no significant inter-group differences in any of the other items. 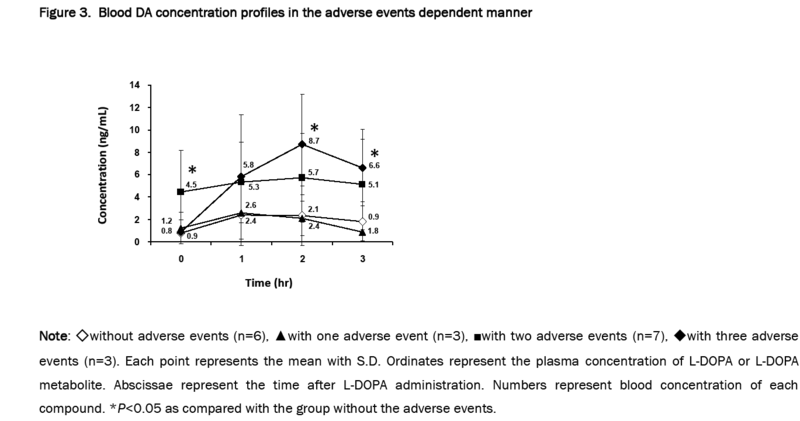 The blood DA concentration in the group with adverse events before L-DOPA and amantadine administration was significantly higher than that in the group without adverse events (Figure 2). Although there were no significant inter-group differences at other times after administration, the blood DA concentration in the group with adverse events at 1, 2 and 3 hours after administration of L-DOPA and amantadine tended to be higher than that in the group without adverse events. There were no significant inter-group differences in the blood concentrations of L-DOPA, DOPAC, and 3-OMD at any of the time points. Figure 2: Blood L-DOPA (A), DA (B), DOPAC (C) and 3-OMD (D) concentration profiles in the group without (◇) (n=6) and with (◆) (n=26) adverse events. Details of adverse events, constipation, anorexia, nausea, vomiting, insomnia, sleepiness, hallucination and orthostatic hypotonic were entered in the patients’ clinical records. The patient groups, who had no adverse events, or one, two or three adverse events, were classified and compared for their blood DA concentrations. The blood DA concentrations in the patients who had two or three adverse events tended to be higher than those in the patients who had no adverse events (Figure 3). As shown in Figure 2A, C and D, the blood concentrations of L-DOPA, DOPAC and 3-OMD tended to be lower in patients with adverse events than in those without. This was likely attributable to delayed gastric emptying, which interferes with L-DOPA absorption, thus delaying the peak blood L-DOPA concentration . We consider that the blood concentration of L-DOPA, DOPAC and 3-OMD in the patients with adverse events tended to be lower than those of patients without adverse events. As the patients with adverse events had sometimes received L-DOPA along with other drugs, including MAO or COMT inhibitors, their blood DOPAC and 3-OMD concentrations would have tended to be low. On the other hand, as shown in Figure 2B, the blood DA concentration in patients with adverse events was significantly higher than that in patients without adverse events before administration of L-DOPA and amantadine. Also, the blood DA concentration in patients with adverse events tended to be higher than that in patients without adverse events at 1, 2 and 3 hr after administration of L-DOPA and amantadine. These results suggest that adverse events such as nausea and vomiting are caused an increase in the peripheral concentration of blood DA. As shown in Figure 3, the blood DA concentration in patients without and with one adverse event showed a similar trend. The blood DA concentrations in patients who had two or three adverse events were higher than those in patients without adverse events. This also suggests that a number of adverse events are caused by the increase in the blood DA concentration in patients receiving L-DOPA and amantadine in combination. Gut disorders are the most common complication of Parkinson’s disease, and these affect both quality of life and the efficacy of L-DOPA treatment [8,9]. Soykan  studied the effect of a selective peripheral dopamine D2 receptor antagonist, domperidone, at 50 to 120 mg/day on delayed gastric emptying in 11 Parkinson’s disease patients after ingestion of an isotope-labeled solid meal. After at least 4 months of administration, they found that gastric emptying was accelerated. Asai  studied the effect of a selective 5-HT4 receptor agonist, mosapride citrate, at 45 mg/day on delayed gastric emptying in 5 Parkinson’s disease patients after ingestion of isotope-labeled bread. After 9 weeks of administration, they also found that gastric emptying was accelerated. Using the 13C breath test, Doi  demonstrated significant acceleration of gastric emptying (P<0.05) in Parkinson’s disease patients with delayed gastric emptying after 3 months of administration of nizatidine, a selective histamine H2-receptor antagonist, at 300 mg/day. Our present results suggest that amantadine does not affect the peripheral concentration of L-DOPA and its metabolites. However, adverse events, nausea or vomiting occurred in the patients treated with amantadine, probably because of the increase in the blood DA concentration induced by the drug. It is important to use anti-Parkinsonian drugs that are suitable for each patient, and to choose adequate therapies in consideration of disease severity, drug efficacy and associated negative factors. Pharmaceutical management based on the monitoring of L-DOPA and L-DOPA metabolite concentrations in peripheral blood would contribute to improved therapeutic efficacy for Parkinson’s disease and reduce the incidence of adverse events. Committee on the guidelines for the treatment of Parkinson’s disease, Societas Neurologica Japonica. Guidelines for the treatment of Parkinson’s disease 2011. Davies WL, et al. Antiviral activity of 1-adamantanamine (amantadine). Science.1964;144:862-863. Schwab RS, et al. Amantadine in the treatment of Parkinson’s disease. JAMA.1969;208:1168-1170. Scatton B, et al. 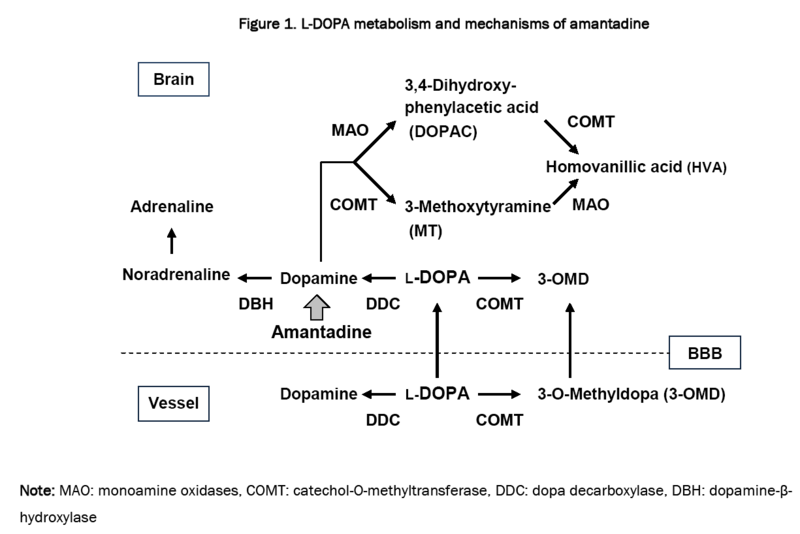 Increased synthesisand release of dopamine in the striatum of the rat after amantadine treatment. Eur. J. Pharmacol.1970; 13 :131-133. Danysz W, et al. Aminoadamantanes as NMDA receptor antagonists and antiparkinsonian agents-preclinical studies. Neurosci Biobehav. Rev.1997; 21 :455-468. Luginger E, et al.Beneficial effects of amantadine on levodopa-induced dyskinesias in Parkinson’s disease. Mov Disord. 2000;15:873-878. Thomas A, et al.Duration of amantadine benefit on dyskinesia of severe Parkinson’s disease. J. Neurol Neurosurg Psychiatry.2004; 75 :141-143. Magerkurth C, et al.Symptoms of autonomic failure in Parkinson’s disease: prevalence and impact on daily life. Clin. Auton. Res.2005;15:76-82. Heetun ZS and Quigley EM. Gastroparesis and Parkinson’s disease:a systematic review. Parkinsonism Relat. Disord.2012;18:433-440. Sakakibara R, et al. Bladder, bowel, and sexual dysfunction in Parkinson’s disease. Parkinson’s Dis.2011;1:21. Satoh M, et al. Monitoringof blood L-DOPA and L-DOPA metabolite concentrations and adverse events in patients with advanced Parkinson’s disease receiving L-DOPA and MAO inhibitor selegiline ((-)deprenyl) combination therapy. Pharmacometrics.2013;84:41-46. Doi H, et al. Plasma levodopa peak delay and impaired gastric emptying in Parkinson’s disease. J. Neurol. Sci. 2012;319:86-88. Murata M.Pharmacokinetics of L-dopa. Special reference to food and aging. J. Neurol.2006;253:47-52. Satoh M, et al.Usefulness of monitoring blood L-dopa and L-dopa metabolite concentrations in patients with advanced Parkinson’s disease receiving COMT inhibitor entacapone combination therapy. Pharmacometrics.2013;85:15-24. Soykan I, et al, Effect of chronic oral domperidone therapy on gastrointestinal symptoms and gastric emptying in patients with Parkinson’s disease. Mov. Disord.1997;12:952-957. Asai H, et al.Increased gastric motility during 5-HT4 agonist therapy reduces response fluctuations in Parkinsons disease. Parkinsonism Relat. Disord.2005;11:499-502. Doi H, et al.Nizatidine ameliorates gastroparesis in Parkinson’s disease:A pilot studyMov Disord. 2014;29:562-566.